In September 2016, Paris Aéroport welcomed 8.6 million passengers, a decrease of 0.2% on September 2015. 5.8 million passengers travelled through Paris-Charles de Gaulle (-1.9%) and 2.8 million through Paris-Orly (+3.6%). International traffic (excluding Europe) was down (-0.6%), due to the decrease in Asia-Pacific (-7.7%) and North America (-2.0%). French Overseas Territories (+5.1%), Latin America (+3.1%), Africa (+2.0%), Middle East (+1.8%) were growing. The number of connecting passengers increased by 0.1%. The connecting rate stood at 25.4%, up by 0.2 points compared to September 2015. Since the beginning of the year, Paris Aéroport passenger traffic has seen growth of 0.9%, with a total of 73.8 million passengers. The number of connecting passengers has risen by 1.3%. Theconnecting rate remains at 23,7%, up by 0.1 point. Passenger traffic at TAV Airports, 38%-owned by Groupe ADP, increased by 3.2% in September 2016 and has risen by 2.3% (1) since the beginning of the year. Passenger traffic at Santiago, 45%-owned by Groupe ADP, have increased by 10.5% in September 2016 and by 11.2% since the beginning of the year. Given the evolution in traffic in Paris Aéroport this summer, Groupe ADP is now forecasting a growth of Paris Aéroport traffic of between 1.0% and 1.5% in 2016 compared to 2015, vs. 2.3% previously (2). Based on this assumption, Groupe ADP is now forecasting a stable EBITDA in 2015 compared to 2015, vs. a slight growth previously (2). 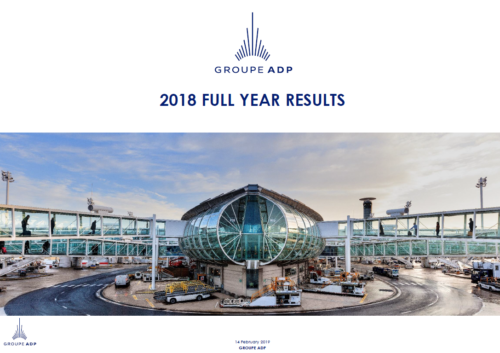 All the events that have occurred since end of July 2016(3) lead Groupe ADP to maintain a forecast of a net income attributable to the Group in slight decrease in 2016 compared to 2015 (4). (1) TAV Airports started to operate the international terminal of Milas Bodrum Airport in October 2015. To be compliant with TAV Airports' presentations, the % change presented above does not take into account Milas Bodrum international terminal for 2015. Taking into account international terminal Milas Bodrum traffic on a like-for-like basis for 2015, total TAV Airports passenger traffic would have risen by 0.5% in September 2016, by 0.4% since the beginning of the year and by 1.8% over the last 12 months. (1) TAV Airports started to operate the international terminal of Milas Bodrum Airport in October 2015. To be compliant with TAV Airports' presentations, the % change presented above does not take into account Milas Bodrum international terminal for 2015. Taking into account international terminal Milas Bodrum on a like-for-like basis for 2015, total TAV Airports aircraft movements would have risen by 2.1% in September, by 3.0% since the beginning of the year 2016 and by 3.6% over the last 12 months.